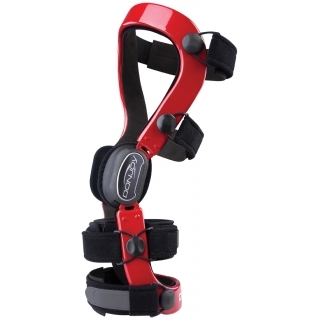 The custom Defiance® is DonJoy's flagship knee brace. With clinically-proven technology including the 4-Points-of-Leverage System™ plus innovative, high-tech materials and design, this lightweight brace provides durable support for moderate-to-severe ACL, PCL, MCL and LCL instabilities. Plus, the low-profile design fits comfortably underneath clothing and sports uniforms, including hockey and football. As the strongest of DonJoy's functional braces, the custom, carbon composite Defiance is recommended for high-collision sports, while its featherweight materials and custom fit also make it the brace of choice for activities of daily living. Available with the LoPro FourcePoint™ Hinge, the only hinge clinically-proven to protect the ACL. Defiance technology is on the field, on the court, on the slopes and in the water protecting knees and providing confidence to those who wear it. First introduced in 1992, DonJoy has produced more than a million braces; in college football alone, 22 of the Associated Press Top 25 teams use the Defiance knee brace. 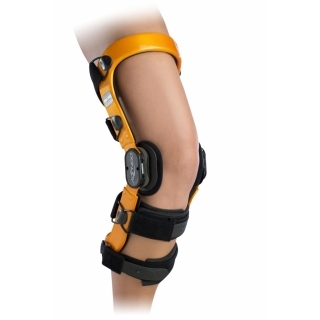 Your insurance company may cover the cost of these knee braces when prescribed by your medical doctor. Please contact your insurance company directly for details regarding your knee brace coverage. How are you measured for a DonJoy Custom Made Knee Brace? DonJoy A22 Titanium - Now in Canada!